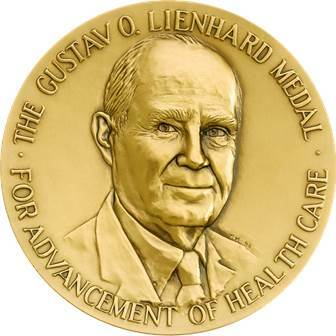 The Gustav O. Lienhard Award, established in 1986, is presented annually by the National Academy of Medicine in honor of Gustav O. Lienhard, Chairman of the Robert Wood Johnson Foundation’s Board of Trustees from 1971 to 1986. The award — a medal and $40,000 — recognizes individuals for outstanding achievement in improving health care services in the United States. Support for the award is provided by the Robert Wood Johnson Foundation. Each year, a selection committee appointed by the NAM reviews nominations based on selection criteria that reflect the ideals and work of Mr. Lienhard and the Robert Wood Johnson Foundation. As of 2018, the Lienhard Award recipient is asked to give a lecture on a topic of their choosing. The Inaugural Lienhard Award Lecture was held on February 27, 2019. A perfected transcript and recording of the Lecture are now available, along with Dr. Stuart Altman’s slide deck. 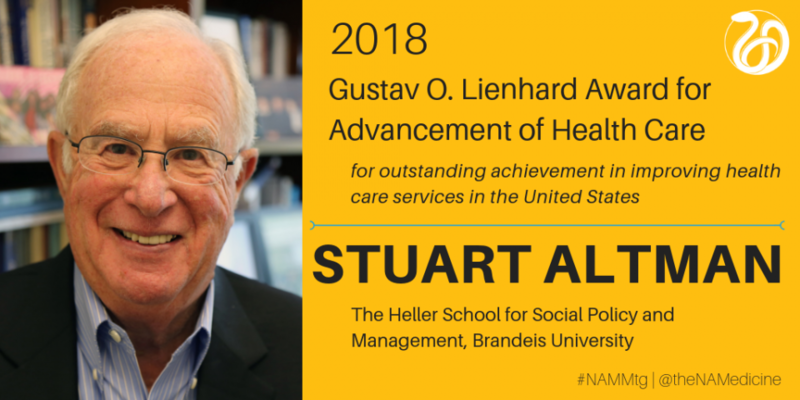 The 2019 Lienhard Award will be presented at the NAM’s Annual Meeting in Washington, DC, on October 21, 2019. Gustav O. Lienhard was chairman of the Robert Wood Johnson Foundation’s Board of Trustees from 1971 to 1986, a period in which the Foundation moved to the forefront of American philanthropy in health care. Prior to Mr. Lienhard’s being named chairman of the Robert Wood Johnson Foundation, he had a distinguished career with Johnson & Johnson, the health and medical products company, where he began in 1932 as an accountant and retired 39 years later as president and chairman of the Executive Committee. Robert Wood Johnson, who died in 1968 after having been chief executive officer of Johnson & Johnson during most of Mr. Lienhard’s years with the company, personally selected Mr. Lienhard to head the Foundation. During Mr. Lienhard’s 15 years at the Foundation, General Johnson’s bequest, valued at more than $1 billion, was received, a staff was assembled, and grants totaling approximately $660 million were made to improve health care in the United States. Finally, the recipient must attend the ceremony to receive the award. 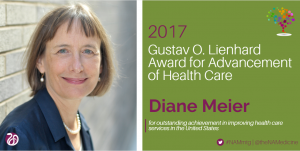 The 2017 Lienhard Award was presented at NAM Annual Meeting in Washington, DC on October 16, 2017. Joseph A. Califano, Jr., LL.B. John E. Wennberg, M.D., M.P.H. Kathryn E. Barnard, Ph.D., R.N. Ruth Watson Lubic, R.N., C.N.M., Ed.D. Faye G. Abdellah, Ed.D., Sc.D., R.N. Loretta C. Ford, Ed.D., R.N.